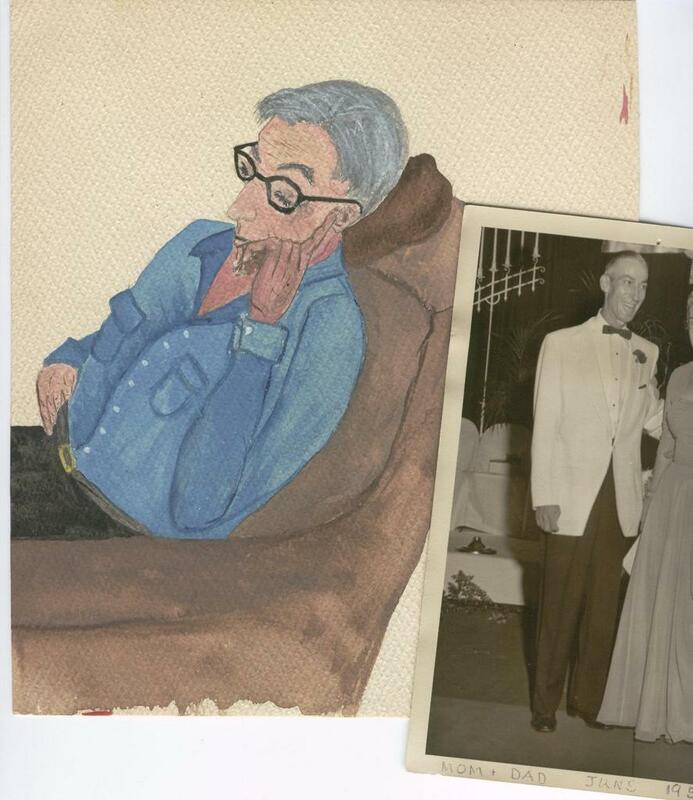 Edit: This is a re-post; I added this photo of Dad and a water color I made of him in 1959. I barely knew my father until after my mom died. She was such a strong personality that he seldom voiced an opinion around her, unless it was to agree with her. I had grown up thinking that my dad didn't have opinions about anything. Imagine my surprise when shortly after she died, he began talking and didn't stop until he got very ill.
Daddy was a laborer; a jack of all trades and master of a few. For most of his life, he worked for Union Carbide, as a maintenance foreman, doing all sorts of repair jobs involving rivets, hammers, drills, screwdrivers, wiring, painting, plumbing, rigging, and you name it - he probably did it. He was always the first man to agree to work overtime, especially on holidays because it meant double time and a half pay. His goal was to make as much money as he could for my mom and me. I don't think he knew how much I would have liked him to be home on Christmas morning when we opened presents, or to be with us at church on Easter and Father's Day. He had a singular goal, and come hell or high water, he was going to do it. Everything he did at work, he also did at home. His weekends (if he was not at Carbide) consisted of him checking out the whole house and yard and doing or planning to do what needed doing. We never had to hire a company to fix the plumbing or replace an electrical outlet or paint the house or mow the lawn. If there was no maintenance needed at the house, he spent his time cleaning and rearranging his tools to ready them for the next job. He climbed onto my roof to vent my dryer when he was 78, and painted his 2-storey home when he was 80. He was about 85 years old when he finally had to admit he couldn't keep up the pace anymore. Union Carbide had a lot of asbestos fibers floating around in the air, and over the years they deposited in my dad's lungs. He also smoked unfiltered Camels for many years, so that took its toll as well. His lungs and eventually his heart gave out and he died at age 91. I was on my way to Charleston when he died. That was over 10 years ago, and I still feel cheated that I didn't get to see him one last time. I hope he knew that I was on my way, even if I didn't get there in time. His funeral was a revelation to me. There were almost 500 people there; men he had worked with, former neighbors, his fellow Masons and Shriners and Eastern Stars and many people from our church. It seems funny now that as a child (and even as a young woman) I had no idea he had made that much of an impact on people. He used to joke that he was so old, there would be no one left to attend his funeral. He was so wrong about that. Person after person came up to tell me what a wonderful man my dad had been, and I was surprised. I knew he was wonderful - but I had no idea everyone else knew it too. He and mom adopted me at birth. Little did I know how lucky I was. You are sadly missed, Daddy! Somewhere, he reads what you wrote, and he smiles. What a loving homage to a great man. Sounds like you were lucky indeed to be adopted by such wonderful people. I bet they felt lucky to have you, too. A wonderful post! Thanks you very much for sharing it! How wonderful that you got to see the impact he made on others, even though it had to come after his death. He was lucky to live to such a ripe old age, considering his work and smoking! He sounds like a great guy. Here from Michele! What a touching post. I thought about posting about my dad, couldn't do it. Another day, Father's Day is not as bad as the anniversary of his death or his birthday, but it's still tough. It's so funny about how your dad was quiet until after your mom died. You must have been so surprised! And 91 years, so lucky for you all. Oh what a beautiful Father's Day tribute. I'm missing my dad today, too, Judy. Your dad was a hard worker. That was how he showed his love. He loved you and your mom by making sure you would never have to feel the insecurity of poverty. It's a shame that today so many men are flash and show with nothing on the inside. How wonderful that you have learned how many lives he impacted. The men who have deep commitment to their families, who listen long and speak less but live their beliefs, these are the real gems. Your father was a gem. Thanks for sharing those words about your Dad. I'm glad you came to appreciate him in the end. Kind of sad, though, that it took so long. Wish he could have been able to balance more time with you and taking care of everyone/everything else. But that's tough sometimes for a man to do, especially in the culture of that time. Your blog was not only a wonderful tribute to your dad, but also a notice to all the fathers out there. Many fathers have great love for their children, but find it hard to communicate on their level and it is hard for a little child to understand that. What a beautiful tribute to your father!! I remember him always puttering around your house. You had such a nice home on Park Avenue in Charleston. From the things you wrote about your father in your blog he loved you dearly and spent quality time with you when he had it. I liked the time you mentioned going to the Dairy Queen. My dad took me to that same Dairy Queen often. I used to think my dad didn't know that many people but he also had a massive funeral. Dad was only 53 when cancer struck him down. Keep on writing your lovely thoughts and feelings. Keep that sense of humor going on and on also. This is one of the best Father's Day stories I've ever read. People came out of the woodwork for my Dad's funeral too. Fortunately, I knew about him, and I knew they would. Oh Kenju, what a wonderfully loving post...it brought tears to my eyes. Your father does indeed sound like a wonderful man, which does not surprise me because he is one half of the couple that raised a wonderful daughter. That is so sweet. You can honestly tell alot about someone when you see how many people take their time to say one last goodbye. Sounds like you were a very lucky girl. I do believe others have said it all here... but I'll add my two cents. This was an incredible tribute to a hard working, family-dedicated man who clearly touched the lives of many along the way. And by the way, he also raised quite a lovely lady. Lucky you AND lucky him! What a wonderful tribute to your dad...I'm so glad you are Muzik's Mystery site today or I would have missed such a wonderful read. Thank you! I'm sorry you lost such a wonderful person. Thank you for sharing a little of him here with us. Also, thank you for coming by Home Fires. That was just beautiful, Judy. I'm glad you finally did get to know him. And he you, in turn. Wonderful post! And congrats on the 6 month anniversary and being Muzikdude's site of the day. I really enjoyed reading this about your dad. I lost mine about 24 years ago and can relate. I came via Muzik Dude, and this is the second time I've been referred here. I'll take that as an omen and add you to my Rising Stars roll. What a beautiful post. He hears you, and he's proud. This was a quite touching story about your dad. You are very lucky to have had a father such as yours. At my brother Jim's funeral, I was also shocked at how many people came out. Some didn't get in because there was no room. A lot of it was from guys who he worked with at two plants over the years...a real brotherhood, I found out. I'm sure he knew you were on the way! Many men did and still do bury themselves in thier role of provider, because they don't know how else to express their love. I'm glad that you did finally get a chance to know him better in his later years. What a wonderful Father. I liked the watercolor you did of him. I also wanted to remind you about Friendly Friday. Interesting that you got to know your Dad after you mom died. I got closer to my mom after my Dad died. Thank you for sharing that story Judy. I'm sure that your dad got as much joy from having you as a daughter as you did from having him as your dad. Thanks for visiting my site. I like your blog and especially your subtitle "you have no right to set up standards and ideals for other people". As for this post kind of the same thing is happening to a friend of mine now. His mother has died, and due to this his relationship with his father has exacerbated. It's of course different from when your father died, but what I mean is that when a person joins the family (as with a baby) or goes, the relations between all other members change. Your dad sounds like one of the worlds great unsung heroes. People who make the world better just by being there. I know another Dad like that: My own. Ain't they sweet? What am I doing? It's not YOUR birthday, it's Poopsie's. Sorry to put the age on you, Judy. Sounds as though he and my dad are cut from the same WV cloth. What a wonderful tribute. This was just as touching the second time I read it. I love the watercolor, Judy. Very nice and a great likeness. We were lucky to have such wonderful dads. Mine never talked much either - and seemed reluctant to offer an opinion unless specifically asked. Sadly, my mom's death didn't change that any. What a lovely tribute to your dad. I also liked the watercolor you did of him. That was a very well written and thoughtful post about your Dad. He must have been truly honorable in so many ways. That's a lovely tribute, Judy. It's a sad fact that we usually don't know how many people count themselves as our friends until we're dead--and then it's too late to do anything about it. But at least you were able to see how much of an affect your Dad had--and I'm sure that's changed your life in a host of ways. How have I missed your blog before? It's great. This post and the ones below. Lovely and lovingly written. The watercolor is very special. That was a wonderful post about your dad. I really envy you having that kind of perspective of him. I'm sure I'll be a frequent visitor in the future. Thanks for visiting me and for the complement on the blog skin. Wow that is a great story about your dad. I am sorry that you did not make it in time to see him one more time but I bet he knew you tried. I'm glad they turned out to honor him with their respects. Those who do come out to services are often only a portion of lives moved by a special life. Your dad had influence. What a thing to be proud of. What a beautiful post about your father. A Dad to be proud of and to cherish his memory. What a wonderful remembrance, Judy.